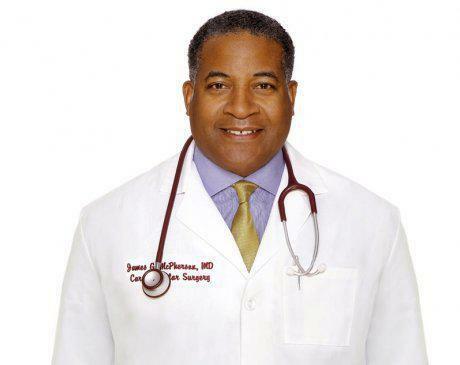 Cardiovascular & Thoracic Surgeons of Ventura County Providers James G McPherson, M.D. Dr. James G. McPherson is a cardiovascular surgeon at Cardiovascular & Thoracic Surgeons of Ventura County, located in Oxnard, Ventura County, CA. He is also a medical director of the Los Angeles Cardiovascular and Thoracic Surgery Group. Dr. McPherson is board certified in thoracic surgery and performs all aspects of adult cardiac, general thoracic, and peripheral vascular surgery. Dr. McPherson received a bachelor’s degree in chemistry from the University of Southern California. (USC). He then attended Tulane University where he received his Doctor of Medicine degree as well as a Masters in Public Health. He then completed his general surgery training at St. Luke’s Roosevelt Hospital Center in New York City. There, he continued his interest in cardiovascular surgery while working with Dr. George Green, a pioneer in the use of the internal mammary artery as a conduit for coronary artery bypass surgery. As Chief Resident, McPherson was awarded the Outstanding Teaching Award. Dr. McPherson returned to USC for his cardiothoracic surgery fellowship where he studied under renowned surgeon Dr. Vaughn Starnes. In addition, Dr. McPherson studied esophageal and pulmonary surgery with Dr. Tom DeMeester, an international leader in this field. After serving four years on the USC faculty, Dr. McPherson founded the Los Angeles Cardiovascular and Thoracic Surgery Group. The practice focuses on minimally invasive heart valve surgery, early diagnosis and treatment of lung cancer. Dr. McPherson is one of the only surgeons in Los Angeles performing thoracic surgical procedures utilizing the da Vinci surgical robot. He has also trained extensively in endovascular therapy for the aortic aneurysmal disease, lower extremity peripheral arterial disease, and chronic venous insufficiency. He is a firm believer that minimally invasive approaches decrease both postoperative pain and the hospital length of stay. Dr. McPherson has demonstrated medical staff leadership as chairman of cardiothoracic surgery at Providence Little Company of Mary Medical Center in Torrance from 2010-2013. Under his leadership, the 442-bed hospital has been awarded the Trueven Health Analytics (formerly Thompson Reuters) Top 100 Hospital Award for the second consecutive year. Dr. McPherson has provided vital leadership in achieving quality outcomes and blood conservation. He was recently appointed the chairman of the general surgery section at St. Vincent Medical Center. He has also served as chairman of surgery at Centinela Hospital Medical Center and Medical Director of Cardiovascular Surgery at St. Vincent Medical Center. Dr. McPherson’s charitable work includes serving on the boards of the Los Angeles American Heart Association, Barlow Respiratory Hospital and Challengers Boys and Girls Club. He is fluent in Spanish and has made numerous television and radio appearances educating the public on heart, lung, and vascular disease. In his free time, he enjoys travel and is an avid fan of tennis.